PRINCETON, N.J. -- For the third consecutive year, a majority of Americans (52%) agree with the position that it is not the federal government's responsibility to ensure that all Americans have healthcare coverage. Prior to the start of Barack Obama's presidency in 2009, a majority of Americans consistently took the opposite view. The most recent data were collected in Gallup's annual Health and Healthcare poll, conducted Nov. 6-9. 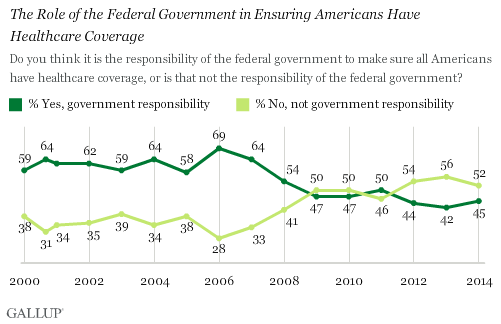 Gallup first asked this question in 2000, when 59% of Americans said it was the federal government's responsibility to make sure all Americans have healthcare. This sentiment peaked at 69% in 2006. Americans' attitudes began to shift in the 2008 poll, conducted just after Obama was elected, and became evenly divided after Obama took office in 2009. During this time, Republicans and independents became more likely to say universal healthcare was not the government's responsibility, most probably in reaction to Obama's campaign promise that he was going to attempt to do just that. This non-government-involvement view became more pronounced in 2012 and has been the majority opinion in the U.S. over the past three years. 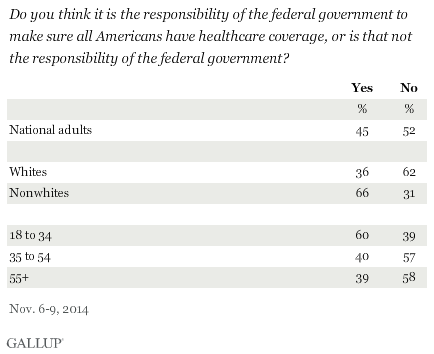 The political divide on this fundamental issue is evident -- although not universal. 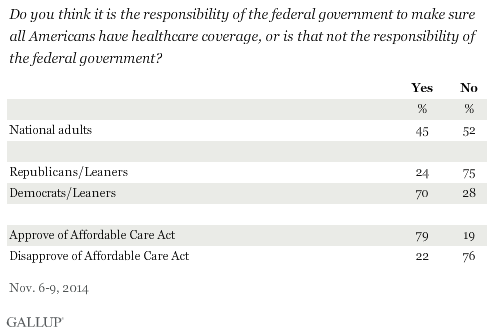 While seven in 10 Democrats and Democratic leaners agree that providing healthcare coverage to all is the federal government's job, three-quarters of Republicans and Republican leaners disagree. The federal government's role in ensuring healthcare for all of its citizens is at the heart of the political controversy over the Affordable Care Act -- given the mandate it places on individuals to participate in the system. Views of the ACA are themselves highly partisan, making it no surprise that 79% of those who approve of the ACA also say it is the government's responsibility to ensure universal healthcare, while 76% of those who disapprove of the ACA say the opposite. Differences in views of government's role in health coverage by race and age mirror the political orientations of these populations. Two-thirds of nonwhites and 60% of 18- to 34-year-olds, both significantly Democratic constituencies, believe it is the government's responsibility. This sentiment drops well below the majority level among whites and those aged 35 and older, who tend to be more Republican. Even among the group of Americans aged 55 and older, many of whom have government-provided Medicare but who lean Republican politically, 58% say it is not the government's responsibility to provide healthcare. Americans' attitudes about the federal government's role in ensuring that all Americans have healthcare coverage shifted significantly after Obama was elected in 2008 and first took office in 2009. Given that Obama campaigned on a pledge to expand the government's role in ensuring healthcare coverage for Americans, and then pushed for and obtained passage of the landmark ACA in 2010, these tangible manifestations of a larger government role in healthcare most likely created a significant backlash, particularly among Republicans and independents. Americans' attitudes about the government's role in ensuring healthcare coverage help explain their reactions to the ACA. The act's proponents have pointed out that Americans favor a number of the act's provisions when tested in isolation, and that the act has already lowered the nation's uninsured rate. Yet, a majority of Americans continue to say they disapprove of it, even as the ACA is making progress toward its stated goal of expanding health insurance coverage. That more than half of Americans think it is not the government's role to make sure Americans have healthcare coverage suggests that opposition to the ACA may be centered more on its philosophical underpinnings, rather than on the specifics of its actual provisions and outcomes. Days away from the beginning of the second enrollment period of the Affordable Care Act, 37% of Americans said they approve of the law, one percentage point below the previous low of 38% in January. Fifty-five percent of uninsured Americans plan to get health insurance, while 35% say they instead will pay the fine as required by the Affordable Care Act. Seven in 10 uninsured are aware of the requirement but 28% are not.